At the Eastern tip of Java, approximately 25 kilometers from where the island is separated by a narrow strait with Bali, lies the sulfur belching crater of Ijen. For decades, this has also been the place where up to two hundred men mine the yellow substance that is used in the chemical industry, for fertilizer, fireworks, and many other things. the men carry empty bamboo baskets up the volcano and down the crater rim. The path is steep and rugged and loose gravel makes it slippery. At the rim, the path almost completely disappears. With only a small LED-flashlight the men skillfully navigate around rocks and huge boulders, all covered in a thick layer of yellow-grey sulfur dust. An active vent at the edge of the turquoise crater lake is the source of the sulfur. Volcanic gases are channeled from the vent into a system of ceramic pipes, where they condense. At the end of the pipes, hot, liquid sulfur flows out onto the ground and solidifies. A worker then smashes the sulfur to manageable pieces with a metal rod, making it easier for the miners to collect the sulfur. covering nose and mouth with a wet cloth and closing the eyes is all what most men do to combat this. Lucky ones wear a simple facemask left behind by tourists. When the workers have loaded their bamboo baskets with chunks of sulfur, they face the biggest challenge of the day: the grueling journey up the rim to the final destination, a collection point near the main road five kilometers away. The way up is incredibly steep –percentages of more than fifty percent are common –­ and leads through extremely rough terrain, with no real path to follow. An extra challenge is avoiding the steady stream of other workers and tourists along the way, while wearing cheap rubber boots, some even flip-flops. With this load, one step in the wrong direction could mean death. that tourism brings. Some act as a guide or sell pieces of sulfur cast in funny forms. Others received masks, clothes and other usable items that are frequently donated. Those fortunate enough to own a motorbike sometimes bring tourists back to their hotel. At the collection point each baskets is weighed. After they have unloaded their sulfur into a truck, the men receive their salary. The stronger miners are able to turn in 120 to 150 kilograms a day – in two runs – making an average of $10. (During my stay in December 2012, a kilogram of sulfur sold for 900 rupiah, about nine dollar cents at the time) This might seem low by Western standards, but it far exceeds what these men would be able to make as a farmer or with another job in this part of rural Java. 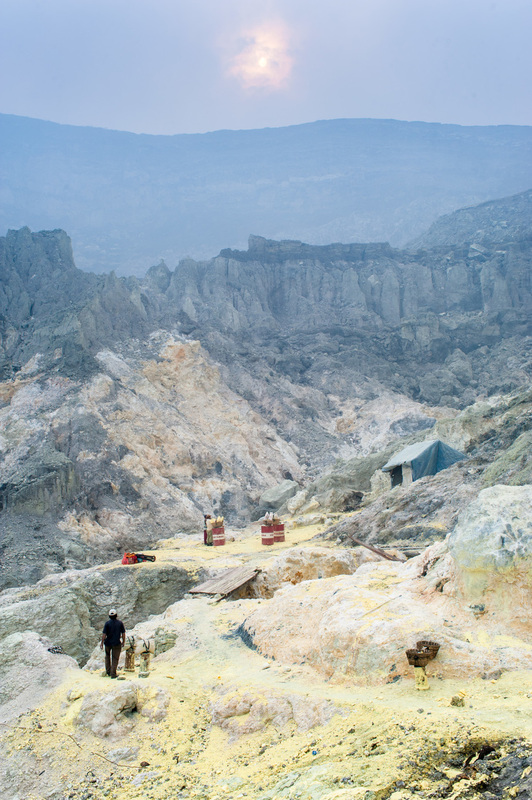 In addition to a workplace, Kawah Ijen remains a site of surreal beauty. Early morning, when the sun slowly rises above the crater rim and soft, diffused sunlight starts hitting the rough terrain, it feels like you’re on another planet. The views over the kilometer wide caldera and the largest acidic lake in the world are simply magnificent.